Hotel Marketing .com reported that CR stepped into the fierce battle between Google and travel web sites over the search engine’s intent to buy ITA Software because it was genuinely concerned the deal would negatively impact the flying public. ITA creates and controls most of the web’s crucial airfare search data, such as back-end pricing and itinerary content for big names like Kayak, Orbitz, American, Continental and others. CR’s Blog Post noted that FairSearch.org, which represents consumers and leading players like Expedia and Travelocity, is equally concerned that the deal, if approved by the U.S. Department of Justice, will raise prices for consumers, limit choice and compromise the openness and competition of the Web which is critical for its health. FairSearch even has a clever video on its site, “Google Buys ITA: A Travel Story” which leaves no doubt where the site stands. But given the clout of Consumer Reports, its warning bells will be heard the loudest. While CR acknowledged Google’s promise honor existing agreements, and its denials that the transaction will harm competition or limit choices for the consumer, Consumer Reports is not convinced. Consumer Union, which published Consumer Reports, has a long history of investigating travel issues, especially through its Consumer Reports Web Watch. Its expression of concern at the deal will doubtless be heard by relevant government agencies. The Department of Justice will likely approve the purchase. But the stage may now be set for The Department of Transportation to investigate further, leading to an even fiercer battle. To add to the debate over a monopolizing Google, the rumor mills are alive today with the possibility that Google will now buy Groupon for between 5-6 billion dollars, about 75 % of the two-year old company’s valuation. 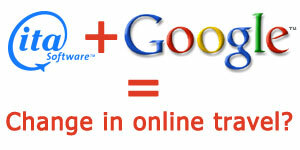 This gives Google a crucial toe-hold in the local business market.